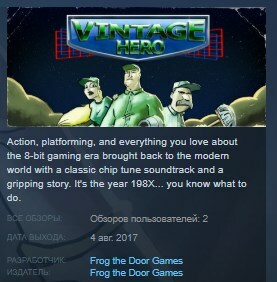 It's the year 198X... you know what to do. 6 CHALLENGING STAGES - Choose the order in which you'd like to play while an intriguing story unfolds. 7 PUNISHING BOSS BATTLES - Find the boss weakness using powers from defeated bosses. OVER 25 UNIQUE ENEMIES - Dodge, shoot and level up while using your skills to master old school action platforming.